Always love to find new ideas for the serger and Bernina has a nify pair of gloves. 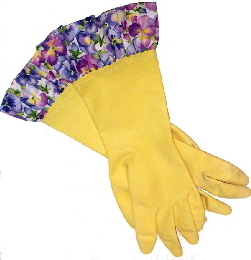 Buy regular kitchen gloves and add a nice ruffle to the edge. I plan to make my ruffle from oilcloth! Looks fairly quick and easy so thinking of some nice gifts while I am at it. Wow, I love this. It might make cleaning a little less boring. Cute! Another reason for me to learn how to use my serger this spring. With these lovelies, even housework might be fun!